The first impression is always essential! This is valid not only for meeting new people, but also for intruding your home to somebody for a first time. Thanks to our long term experience in the domestic services, we are able to provide you with a great solution for your exterior cleaning. The Jet washing is using the latest technology in rotary surface cleaning, providing not only the use of high-pressure, but also a low water consumption technology. This will easily help you to see the brick colours of your house, garden or patio as they should be! 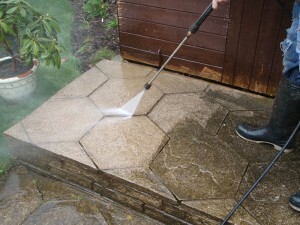 The Jet washing is great for providing a long term solution to weeds and moss in your drive, for cleaning all type of tarmac, concrete or brickwork. Our jet washing solutions are tailored to every of our customer’s needs and could be changed to match the individual nature of every domestic or business requirement. The Jet washing services vary from the removal of graffiti in public places like buildings, walls and bus shelters to high pressure jet laundry and cleaning of public monuments and statues. Our professional technicians will provide you with a high quality cleaning service at a very competitive price! We are available 7 days a week, and can cover all parts of London and Great London, ensuring Jet washing for both residential and commercial customers.